Abstract The study of community and citizen engagement in municipal decision-making is important within the field of municipal politics. Fundamental disagreements exist concerning whether community activism is capable of influencing municipal decision-making and secondly, whether any such influence is desirable. Some scholars argue that wealthy groups, which are not representative of the wider community, are more likely to secure influence. 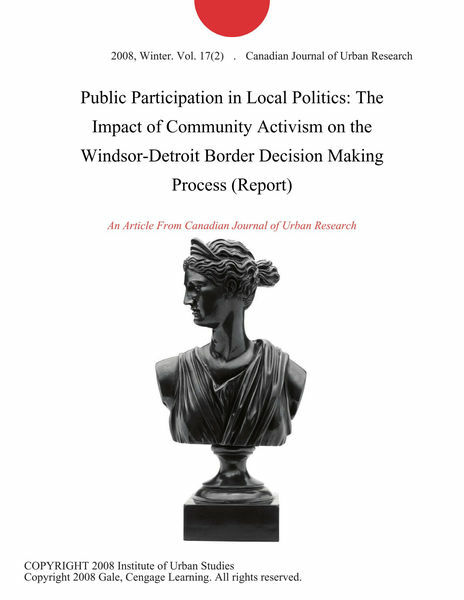 This article examines these issues by analyzing Windsor City Council’s response to a community group’s opposition to one proposal to construct a new Windsor-Detroit border crossing. The article concludes that the group did influence the municipal government’s response to this proposal. It also concludes that although the group did have significant financial and other political resources not available to all community groups, it is not necessarily the case that the end result was disadvantageous to the entire municipality. Instead, the group’s help in sidelining the proposal may have left political space for the development of better reform proposals.